Lobster Lift is a self-surfacing lobster trap attachment that eliminates entanglement without changing how lobstermen catch lobsters (patent pending). Team Aquamedics with Ivan and Nicholas of Proteus 3D printing company. Rock Lobster is a system to quickly attach coral to reefs so that divers can plant a lot of baby coral into the oceans and restore coral reef populations. 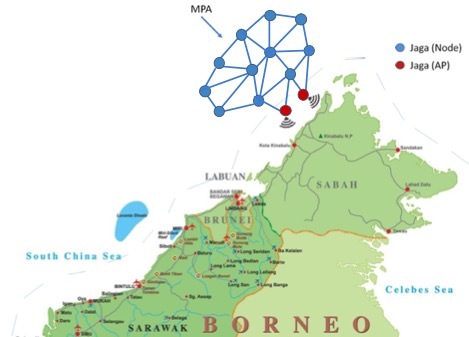 MPAs need better monitoring & enforcement. "Scoutbot Kuching" is a semi-autonomous boat that is targeted to monitor marine protected areas & it could map shallow coral reefs. 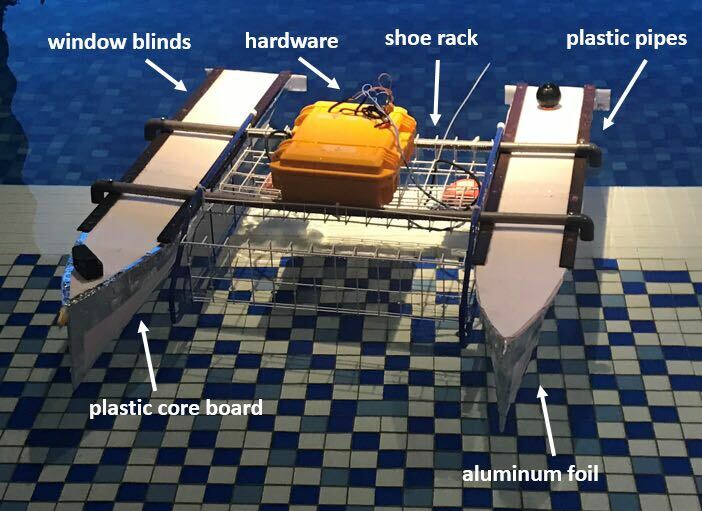 Excluding the hardware housed in a waterproof case, the boat was made of inexpensive equipment sourced from Mr. DIY, a sponsor of Make for the Planet Borneo. A constellation of two types of buoys: Deter buoys will broadcast on Marine VHF, warning fishers they are entering a protected area and face confiscation and jail if they fish here. Detect buoys will use a phased array of passive sonar hydrophones; the on-board processor will classify contacts as fishing boats by the sounds of their engines and gear over time, and the phased array will give direction. Hooks By Team Don’t Panic! Problem: People are not aware of the benefits provided by Marine Protected Areas (MPAs). Solution: Hooks - an app that links to What's App and Facebook messenger to host discussion groups, consolidate weather information, news, workshops, and maps relevant to users of MPAs and the protections that they provide. A Conceptual image of the Jaga system. Demonstration of Jaga buoy during the pitch session. The prototype uses low-cost electronics & housing. A low-cost internet of things (IoT) mesh network of buoys with self-healing capabilities to send AIS information (and other data) to bases on land. This technology can transmit boat locations & behavior in real-time to aid in enforcement of MPAs. 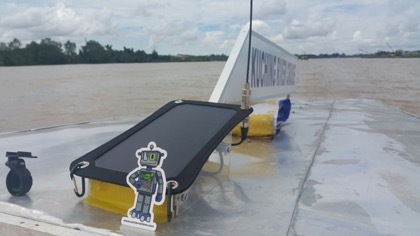 SuperFISHALL device on a boat in Kuching. Sea Patriots team demonstrating their tech. This solar powered device incorporates AIS receiver as the first data layer to enable location-based services. The secondary data layer would be images captured semi/fully automatically by an on-board camera if there is any flagged/suspicious vessel within camera visibility approximately 100 meters and at the best resolution available. The data collected will be relayed simultaneously to connected mobile phone via Bluetooth and a special app that acts as data middleware before feeding data to our dedicated cloud as long there is GSM connectivity. This app is also capable to store backlogged data to support unstable GSM connectivity. Schematic of the Pay to see community reward system. Morays on a Mission pitch their solution. Problem: Sharks and other marine life are worth millions alive, but not for local communities. 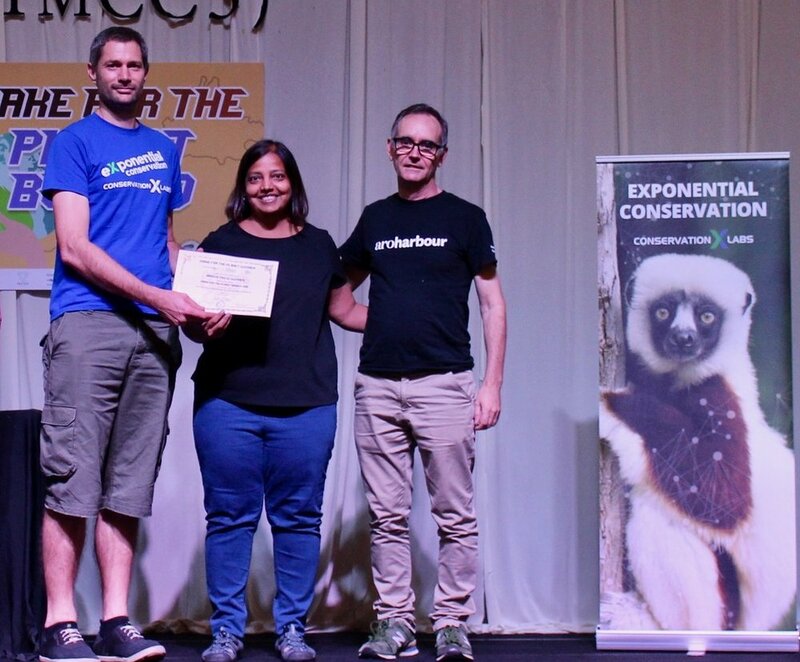 Solution: An app & reward mechanism that will make "you get what you pay for" a reality for divers and marine wildlife tourists, whilst benefitting local communities in developing countries. The payment and sightings information is transferred to local communities on a secure public ledger. Community will be incentivized to enforce no-take of key animals. Team BIG Beyond demonstrating their app at the IMCC5 poster session. An app to incentivize and encourage accurate catch data from fishermen/captain. Fishermen can collect rewards, build a reputation through rankings by other app users, and share fishing events (or, for example, plastic trash collection events). Buyers can access reliable supplies from trusted fishermen and governments & NGOs can gain access to reliable supply and traceability data. Team 4Flyers demonstrating their app in the IMCC5 poster session. 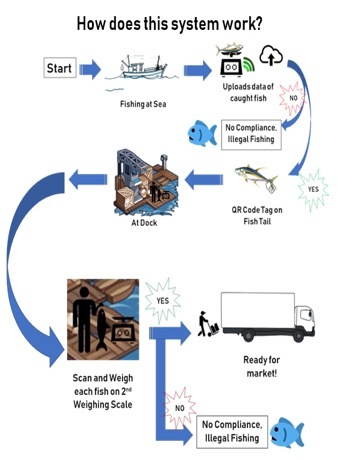 An end to end IoT to cloud system to trace seafood caught at sea using fish weights & QR code tags. Fisherman get rated through the system, and their profiles are showcased on the website as being in compliance. The system is modular and scalable. Team Harapan working in the M4TP Makerspace. A big data ecosystem that consolidates data verification, e-commerce market place, and block-chain technology to facilitate an incentive system that allows sustainable and scalable traceability in the fisheries community. Transactions via the app will provide incentives for the fishermen (crew, captain, boat owner, middle man); it will provide security for target buyers (local markets, retailers, restaurants, manufacturer/processor); and it will provide traceability for target partners (gov't, insurance body, NGOs). Garbage Star and Plank of Cameras by Team Box? What Box? Garbage Star: a low cost bamboo frame for collecting plastic and growing fish; grow fish and collect plastic on the same structure. 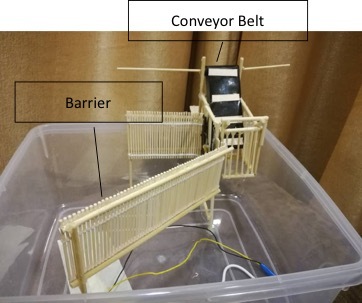 Plank of Cameras: High resolution cameras made from mobile phone parts for measuring plastic in rivers. Team Sea Warrior with a model of the Winseal Watermill. WinSeal Watermill is a hydropower trash collection device for rivers made from local products (in Indonesia) like rattan and bamboo. Problem: Plastic straws are ubiquitous and single-use items that take hundreds of years to biodegrade. Solution: Work with an innovator in Vietnam, Nguyen Van Tien, to scale straws made of grass, Leprionia ariculata. The raw material is easy to grow in Vietnam (Mekong Delta) & it’s less expensive than stainless steel and bamboo straw replacements. 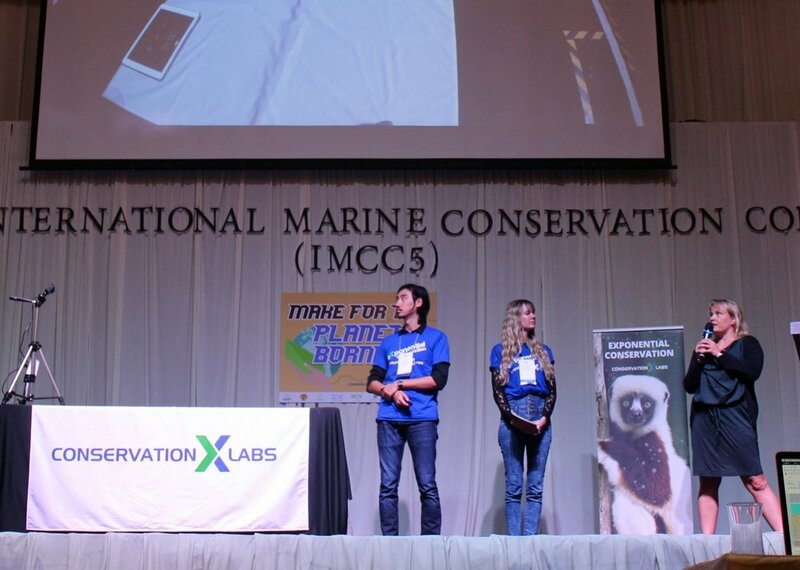 Team Seahorse Warriors demonstrating the Bubu Trap at the IMCC5 pitch session. Working model of the Bubu Trap constructed at M4TP. The Bubu Trap is a device to capture trash in river ways that also allows boats to pass through. The device includes a conveyor belt and the team envisioned that it will be powered by hydro and solar power.